Pivot Pegz are acessory foot pegs for off-road or dual-sport motorcycles. They rotate forward and back and they are spring-loaded but they automatically center for normal riding. This provides a certain amount of shock absorption, which is useful when riding off-road. The Pivot Pegz concept is pretty simple and the execution is extremely well done and once you get used to the concept of freeing your ankles, they work great. Foot pegs are the most under-rated controls on a motorcycle and most people never even think about them. If you don’t think that foot pegs serve a function for controlling your bike, try having one break while you have weight on it! Suddenly having all of your weight on one side of the bike will either get absolutely all of your attention very quickly…or just as quickly it will ruin your day. PivotPegz have been mentioned in a few webBikeWorld reviews because they were intstalled on a couple of bikes. We never got around to reviewing them however, so now’s the time. Broken original equipment foot peg. Note porosity in casting (arrow). Why change foot pegs? Most owners never have and never will, yet they have a long and happy relationship with their motorcycles. If a foot peg breaks, most likely it would be replaced with a new one from the dealer for around $20.00 to $30.00. However, as always, the aftermarket does provide upgrades that are worth considering. One reason to consider an aftermarket foot peg is reliability. The original equipment foot pegs included on most motorcycles are made from cast metal, which makes them brittle. 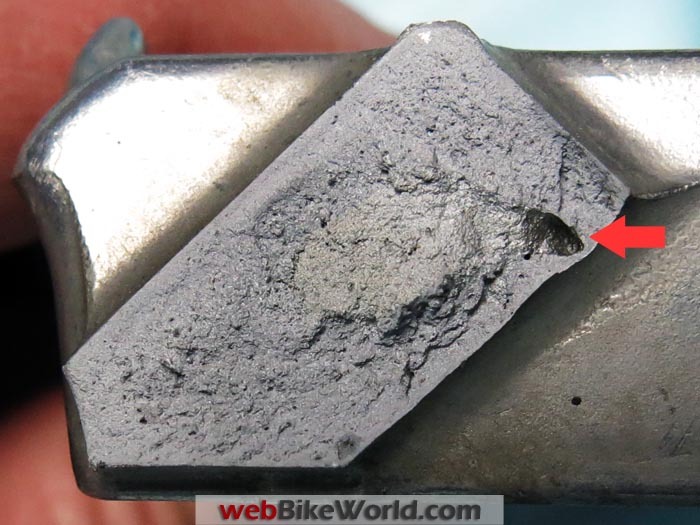 I broke one recently and it revealed a casting porosity, which caused a fracture that radiated out from a large hole (red arrow in photo above) inside the base of of the foot peg. It was a good thing that this was found after picking the bike up from a tip-over, rather than having it break under foot while riding a rough dirt road in the standing position. The reason for the word “Pivot” is that unlike stock foot pegs, which are an unmoving platform for your feet, Pivot Pegz rotate forward and back around a central shaft. On rough terrain, the rotating action adds comfort and assists control. Made in Australia since 2000 and available for a variety of off-road and dual-sport bikes, there’s a good reason for Pivot Pegz to be priced substantially higher than original equipment foot pegs. The difference begins with the engineering and manufacturing of the products. The central shaft is the spine of the Pivot Pegz and it is also a casting, but these are investment castings made from high-strength stainless steel that are then machined and heat treated twice. A greased Teflon sleeve slides onto the central shaft, with O-rings on either side, ensuring that the cleated platform moves freely with no grinding feel transmitted through the sole of your boot at the Pivot Pegz rotate forwards and back. The company said that Pivot Pegz were used by Mick Extance in two Dakar Rallies with excellent results and decreased boot wear. The cleated platforms are a complex hand-polished construction of their own. The end result is that Pivot Pegz look and feel like aerospace components. And the company has a liftetime warranty on the main parts. Stock Yamaha Tenere foot pegs (L) vs. Pivot Pegz (R). Each Pivot Pegz foot peg has a pair of springs, one to return the platform to a flat orientation and the second to return the tip of the peg downward if it is folded upward. While the owner has the option of leaving either spring off, having the pegs float loosely would probably be a nuisance. One of the main reasons commonly cited to change foot pegs is to have a broader and flatter surface area to stand on to provide more stability and better traction. Standing on normal OEM foot pegs and then standing on a broad flat foot peg quickly reveals what a vast improvement the big flat surface is. Think about standing on the rung of a ladder; a smooth round ladder rung will put stress on the arch of your foot. After spending time on such a ladder you suddenly realize how sore the soles of your feet are and that your ankles are tired. Your feet and ankles won’t hurt (as much) if you stand on something flat. 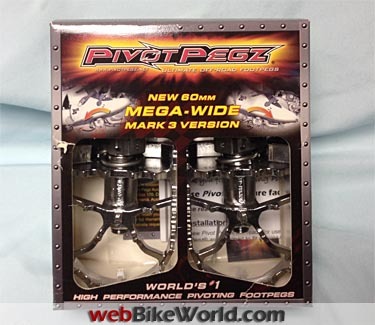 The Mark 3 Pivot Pegz are about 60 mm (2.4 inches) wide and longer than the foot pegs motorcycle manufacturers provide, so they do have that wonderful feel of standing on a flat board. 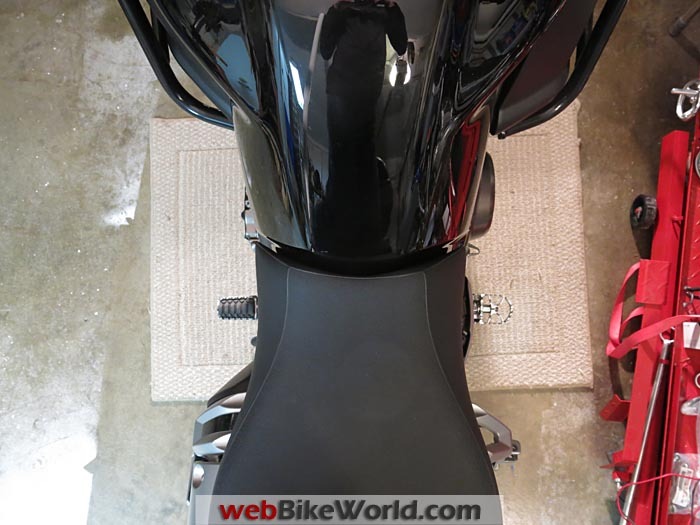 Note that Pivot Pegz are not the only foot peg which has a larger or wider standing area (for example, see the SW-Motech foot peg review) and bigger, wider foot pegs can have a down side. In this case, there is about 32 mm (1.25 inches) less room for your foot to get from the pedal to the shifter with the Pivot Pegz. Since a motorcycle boot is typically more than two inches thick, your ankle needs to rotate a long way to go from an upshift to a downshift. 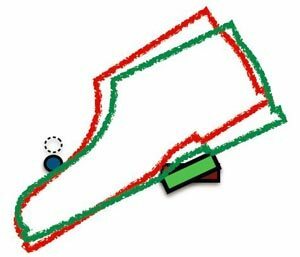 The shorter the distance between the shifter and front edge of a foot peg, the more that you need to rotate your ankle to get into the space. Distance to center of shift lever tip from Pivot Pegz. I measured the rotation of one of the insalled Pivot Pegz and found that it could move about 25 degrees to either side of being flat. Trying to recall high school trigonometry lessons, the added 38 mm (1.5 inches) provides only several degrees of movement change. This was a major surprise, because the subjective improvement in feel when you’re standing on the pegs is remarkable. Looking closer, what seems to make the difference in feel is not the change in angle, it is the lowering of the height of the front of the foot peg. The movement is much more than simply moving your toes on the shifter, because you use the big muscles in your leg and every little bit helps. This rotating movement, which is behind the whole idea of the Pivot Pegz, takes a little time to get used to and some people are uncomfortable with it. After a lifetime of foot pegs providing a rock-solid, unmovable support, having some freedom is a bit strange at first but then is forgotten. Once you do, the real difference is noticed when you get back on another motorcycle with old-style “normal” foot pegs. Stock foot peg on the left and Pivot Pegz on the right (Yamaha Tenere). One other feature of the Pivot Pegz is the cleated surface which is completely open to clear mud when off-roading. Riding gravel roads in West Virginia, the big flat surfaces truly are less tiring than stock pegs. The cleats are sharp enough that you won’t want to wear your favorite pair of sandals or thin-soled tennis shoes for sure; you will feel the cleats! To address this issue, the company has also just released the Pivot Pegz Toppers, a removable rubber insert that fits over the top of the foot pegs for additional comfort. I have used Pivot Pegz with several pairs of boots and as expected for a cleated surface, found great traction. The smooth soles of a pair of road-oriented Sidi touring boots worked extremely well and Alpinestar Toucan boot soles have their own cleats, which locked into the PivotPegz cleats. I was concerned when first starting the ride wearing the Toucan boots, but the ability to pivot the pegs when the two cleated surfaces locked together was a real bonus. With regular cleated dirt bike foot pegs, the cleated Toucan boots sometimes require fully lifting my foot to make a shift or to keep from riding the brake pedal and this was not an issue with the Pivot Pegz. But the biggest difference came when wearing an old set of stiff Fly Racing Maverick motocross boots. Shifting a dirt bike without the ankle movement provided by the Pivot Pegz required lifting my entire thigh and movement at the knee. So while the Pivot Pegz can even cost more than a pair of motocross boots, the increased comfort is worth every cent. The Pivot Pegz concept is pretty simple, the execution is extremely well done and if the concept of freeing your ankles is not too strange, they work great. From “B.M.” (May 2015): “Guess all my past bikes had the rounded or oval pegs which allowed for foot rotation and never had a problem. Purchased a 2009 BMW G650GS (great bike) but on my first road trip of 700 miles those squared off flat BMW pegs had to go. That trip was all on road and just standing on the pegs every 50 miles to stretch and shifting was very painful. At the end of the day my feet hurt so bad that I could hardly walk. I have flat feet and the BMW pegs only exacerbated the agony. Since I’ve had the Pivot Pegz it has been 15k on and off road and pain free! At $169 they are the best addition that I have made to an MC.